The Antoinette IV is 683.4 KB. Larger files take longer to load. This is the Antoinette IV listing page, here you can download the plan, article and see the main thumbnail and extra images. Antoinette was a French aviation company, extremely active in the early 1900s to develop a European engine-powered human-carrying aircraft. Their 1909 Antoinette IV design employed wing warping for lateral control and was propelled by a lightweight eight-cylinder engine, an amazing engineering achievement for that era. Frenchman Hubert Latham was the first person to attempt crossing the English Channel, flying the Antoinette IV, to win a prestigious prize but suffered engine failure and landed in the Channel, eventually losing out to Louis Bleriot who successfully flew a Bleriot XI from France to England in July 1909. 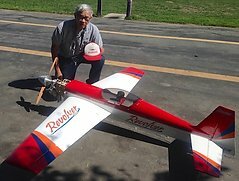 The model shown here is a 1/24th scale 24" rubber powered free flight sport scale model, elegantly drawn up by W.C. "Bill" Hannan, longtime columnist for Model Builder magazine. The Hannan Antoinette IV requires extremely intricate construction skills and is best suited for advanced or expert model builders. An electric powered radio control version, 49" span, is kitted by Sig Manufacturing and would be a better choice for building and flying due to its larger size and Sig's kit engineering. 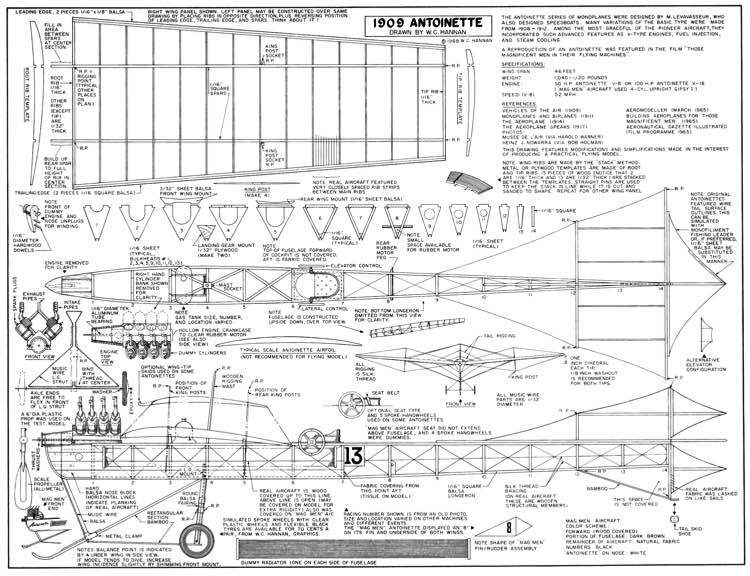 These are the details for the "Antoinette IV" plan. If you would like to become a plan editor and help us to edit the attributes of all the plans in the website please click the "Edit Attributes" button below. Order your Antoinette IV prints today! The Antoinette IV plan can be printed on plain paper, tracing paper or polyester film and shipped worldwide. This tool allows you to calculate the cost of printing and shipping the Antoinette IV plans and its building article if available. If you need to resize a plan please contact us with the ID:79489 and the desired wingspan. I will calculate a price upon request, please contact me here mentioning this PlanID: 79489 and the job you wish me to do. This plan is 683.4 KB and was shared by our member aeroastro on 25/03/2015 13:27 in the PDF Bitmap Wood Model Airplane Plans (1) category. There are currently 42 users online downloading from 23044 available model airplane plans.